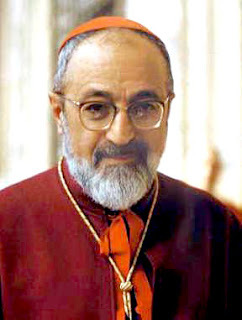 Cardinal Gregorio Agagianian was the foremost Armenian figure of the Catholic Church in the twentieth century, and rose to world fame when in the papal elections of 1958 and 1963 he was about to become the first non-Italian head of the Church in almost 450 years. Ghazaros Agagianian was born in Akhaltsikhe, in the historical region of Javakhk (now in Georgia), on September 18, 1895. His family was part of the local Armenian Catholic community. After studying at the seminary of Tiflis, he went to Rome, where he studied at the Urban College of the Sacred Congregation for the Propagation of the Faith (now Pontifical Urbaniana University) and was ordained a priest in 1917 with the name of Gregorio (Krikor). He returned to Tiflis, where he did pastoral work from 1917-1921. Afterwards, he left Soviet Georgia and became a member of the faculty at the Pontifical Armenian College in Rome in 1921 and Rector of the same college from 1932-1937. He also taught at the Urban College from 1922-1932. Meanwhile, he had been consecrated bishop on July 21, 1935, with a previous appointment as titular Bishop of Comana. The Armenian Synod elected him Patriarch Catholicos of the House of Cilicia on November 30, 1937, with the name of Krikor-Bedros XV. In 1938, after an agreement of the French colonial authorities of Syria and Turkey, the sanjak of Alexandretta (later renamed Hatay) was annexed to the latter. The efforts of the Armenian community of Paris, Patriarch Agagianian, and the Vatican representative to Syria and Lebanon Remi Leprert allowed that many areas of Kessab inhabited by Armenians remained in Syria. In recent years, the Syrian government renamed one of the streets of Aleppo after Cardinal Agagianian to honor his efforts. Agagianian was elevated to the College of Cardinals by Pope Pius XII with the title of Cardinal-Priest of San Bartolomeo all’Isola in 1946. He participated in the papal conclave of 1958, following the death of Pius XII, and received a large number of votes, eventually approaching the majority needed for election. This was confirmed by Pope John XXIII, the elected pope. John XXIII appointed Cardinal Agagianian as a member of the leading body of the Second Vatican Council, where he was a member of the presidency board from 1963-1965. Agagianian was Pro-Prefect of the Sacred Congregation for the Propagation of the Faith from 1958-1960 and full Prefect from 1960-1970. In 1962 he resigned from his position of Armenian Catholic Patriarch. 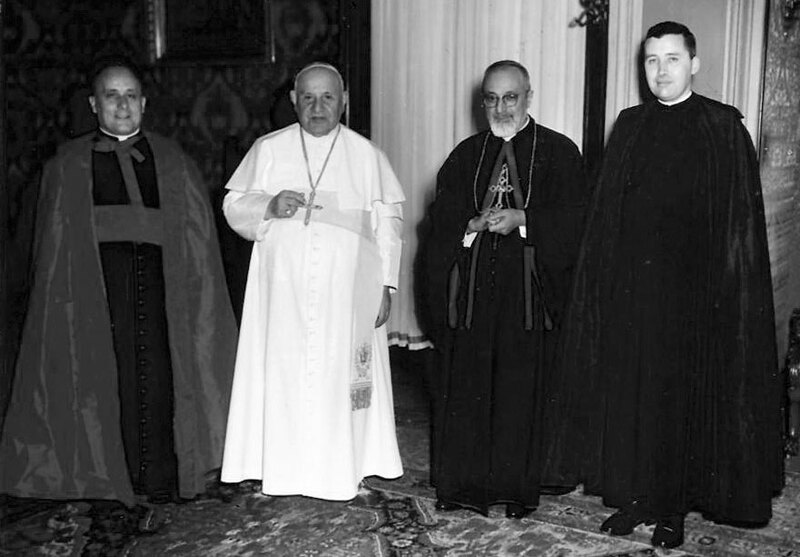 Pope John XXIII standing to the right of Cardinal Agagianian at the Second Vatical Council. After the death of John XXIII, Agagianian participated in the conclave of 1963, which elected Pope Paul VI. He was rumored to have been actually elected, but declined to accept. In 1970 he was elevated to the order of Cardinal-Bishops as Cardinal-Bishop of Albano. Seven months after this elevation, Cardinal Gregorio Aghagianian passed away in Rome on May 16, 1971, aged 75, from cancer. He was buried at the Armenian church of San Nicola da Tolentino, the same place where he was consecrated bishop thirty-six years earlier.